He has made a real name for himself in recent years, most notably during the 2017 season when he was a real showman around the cages. Accompanied by an assortment of pilot fish, “The Legend” was the shark that many of our guests will never forget. 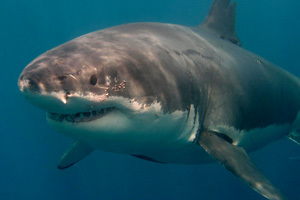 The Legend was tagged by on site biologist and White shark expert Mauricio Hoyos. Mauricio attaches the tags by using a spear pole and the tags typically last on the animals a few months before popping of. Mauricio has set up underwater receivers at various points around the island. When the tagged sharks swim past these receivers, they take a reading and the movements of the sharks is then collected for scientific data. 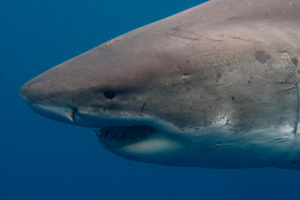 He can be seen throughout the whole season (from September through till December) and is often marked down on our “shark sightings” board more than any other animal! Still a sub adult we look forward to having many more interactions with the Legend and watch him grow up to be one of the islands classic sharks. 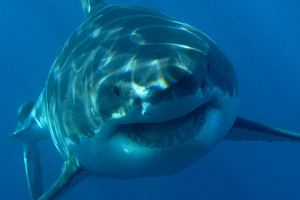 Share the The Legend the shark love on Facebook! Want to meet The Legend? Book with Shark Diving Xperts today!